Last year’s parade with Dolly and her Wild Eagle float. Tennessee’s favorite daughter Dolly Parton is coming home to the Smoky Mountains again this Friday, in time to be Grand Marshal of the 28th Annual Dolly Parade in Pigeon Forge. The parade starts at 6 pm at River Road near Traffic Light #7 and travels north along Parkway to Light #3. 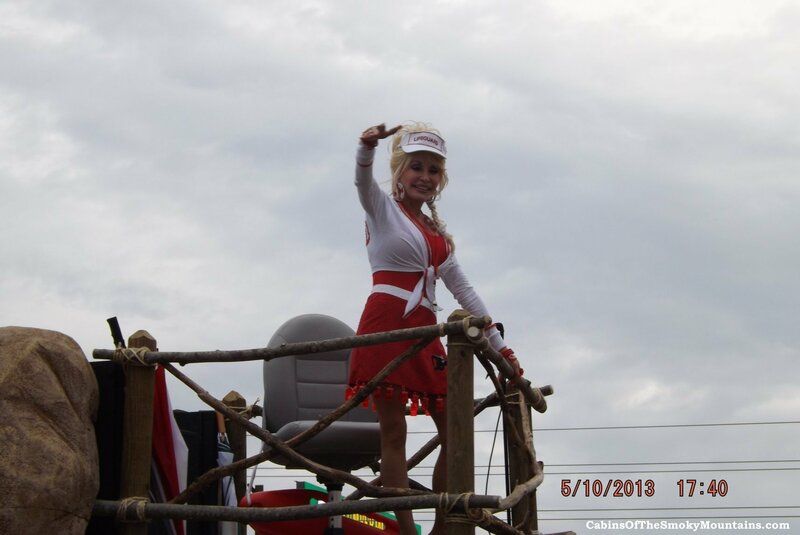 Dolly’s homecoming parade is a great tradition drawing lots of fantastic floats – as well as 50,000 spectators – so get there early with your lawn chairs to find a good spot where you can wave to Dolly as her float comes by. Expect marching bands, costumed characters, local celebrities, entertainers and of course, some outlandish floats. 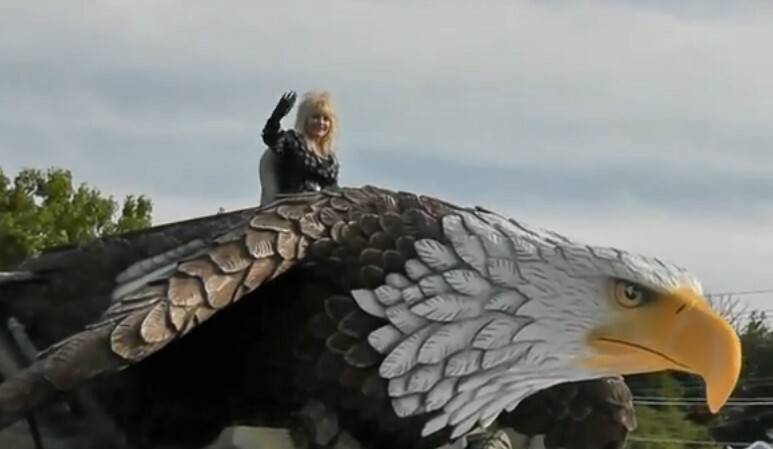 Last year Dolly rode a huge Eagle on a float, and the year before that was an aeroplane. What will it be this year? Maybe something to do with the new Water Coaster ride at Splash Country? We’ll see. Dolly will be at Dollywood Friday and Saturday, May 10 and 11. And Splash Country water park opens for the season on Saturday, with a special opening Friday for season pass holders. It should be a fantastic Mother’s Day weekend, with the greatly anticipated launch of River Rush, Tennessee’s first HydroMagnetic water coaster. Stay tuned for more stories of the Dollywood goings-on soon! 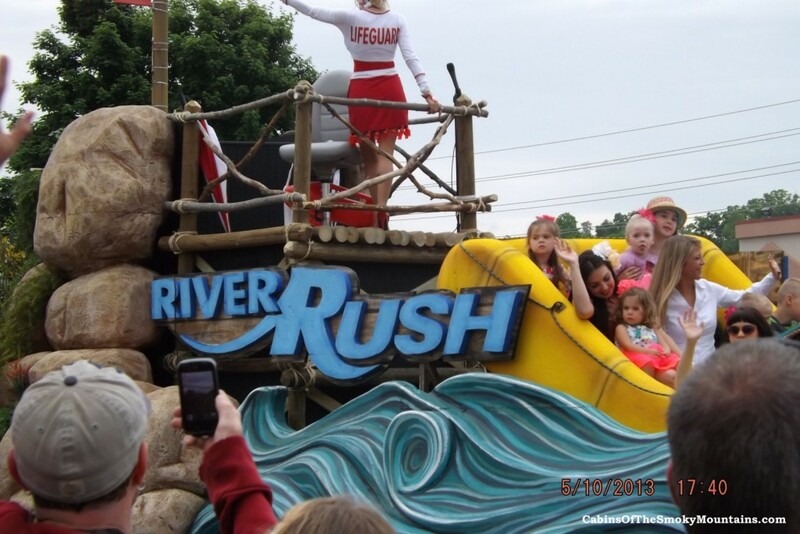 UPDATE: Here are a couple of quick shots from the parade this year, and of course the theme was RiverRush, with Dolly as lifeguard. Dollywood Christmas 2012 – Lights, Action and Bring Your Camera!